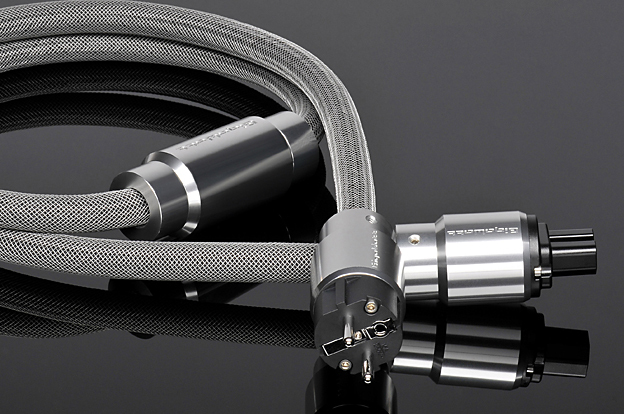 LS-2 MK3 is the new, improved version of the uncompromised power cable from GigaWatt. The LS-2 MK3 occupies the top position among power cables offered by GigaWatt. It is the crown jewel of many years research and hard work on designing a reference power cable. The priority for the LS-2 project was to manufacture an uncompromising product without looking at the costs associated to produce it. This is also a perfect sandbox for creating new and upgrading existing products of GigaWatt. The unique characteristic of the LS-2 MK3 is, that no ready-made component was utilized to create the cable. All elements required for the finished product were designed and made by our company especially for this project or externally manufactured to our specifications. Making one piece of the LS-2 MK3 cable requires lots of hours of handwork and all stages of the process are carefully controlled. This guarantees high quality of the product and repeatability of the subsequent cables. The work wires of the cable are made from a bundle of nine solid conductors with a cross-section of 1.5mm2 each. They are made from highly polished, silver plated, oxygen free copper isolated with FEP Teflon. They are shaped in massive twists of high cross-section and outstandingly low resistance, allowing for almost limitless energy flow. The twisted conductors allow also to limit inductance while keeping the advantageous, relatively high capacitance. The cable is shielded with a very tight copper shield, protecting from EMI and RFI noise. The cable is also protected against vibration induced by the electromagnetic field surrounding the conductors. The wires are covered with a multi-layer vibration damping material. From the outside the cable is additionally protected by a black, textile coat from polyolefin fibers and an antistatic mesh, which does not allow static electricity to build up. Also especially for the LS-2 MK3 we designed a new, double passive filter, made from nano-crystal materials. Its elements were enclosed in a housing from pure aluminum. The filter is mounted in a precisely calculated spot on the cable and becomes another level of protection against parasitic noises and oscillations at the output of the cable. Special attention should be devoted to the high quality, proprietary plugs used to terminate the cable. Its massive construction allows for high durability and reliability. The connectors were made from solid, rhodium plated brass, what guarantees low resistance and high number of connection cycles without losing the parameters. The connectors were also cryogenically and demagnetized. Their massive enclosure is made from solid aluminum. All conductors are connected without soldering, and the plugs are bolted-on, what minimizes the impedance of the connection and increases reliability. The LS-2 MK3 is recommended as a reference cable for powering the whole system. It can be used best for high current units, but it has also proven its usefulness for powering digital and analog sound sources. The cable LS-2HC MK3, high power version, is dedicated to supply current to the top GigaWatt PC-4 EVO power conditioner.